If you ask me where I live, I tell you that I live on the corner of X and Y streets. It was there yesterday, it’s there today, and will be there tomorrow. But I live on a planet in space that’s constantly in motion, as are the other planets in our orbit. My address in space, then, is always in relation to the other planets in orbit, and therefore, constantly changing. This dynamic between planets in motion exists between ideas and events as well, and is a major factor in the evolutionary process of change. New kinds of law and accounting firms, which are more reactive to continuously changing economic and social environments and changing client needs. This is the process. Because of the dynamics of events, most of which were unpredictable, the dynamic seems to have a life of its own. There are so many elements involved that are themselves constantly changing that were unforeseeable, that (to borrow a phrase from Adam Smith), there seems to be an invisible hand at work. However, as we shall see further on, there are techniques to put oneself in rhythm with the process. In fact, it’s possible to use the process for more effective planning. The Bates decision struck down the Canons of Ethics and Code of Professional Conduct that prohibited frank marketing – the mandates against frank promotional activities. This engendered a concept only vaguely understood by professionals at the time called competition. The problem at the time was that unlike the commercial world, there was neither history nor tradition in the commonly used marketing techniques. That meant a few years of groping – of trying to find our way to market within the profound limits of the legal and accounting professions, and of learning the differences between marketing a product and marketing a professional service. This is the phase that I call Professional Services Marketing 1.0. But a few firms – both legal and accounting – took the first steps in the competitive battle. Significantly, as others saw that there might be merit in the process, they followed with their own versions of marketing – versions that were relevant to their own markets and their own skills. Thus, the beginnings of the evolutionary process that produced not only change, but irreversible change. At the same time, the economic and social landscape began to change — specifically, globalization, technology, new laws and regulations. The market for professional services increased public awareness of the value of the professions, which then increased demands for more sophisticated legal and accounting services. Despite protestations by old-timers that, as one lawyer put it, Bates destroyed the profession, Bates, in fact, enhanced it, in large measure because marketing educated the market, and in part because one of the ways marketers use to sell its services is to develop new services and new client-oriented techniques in both law and accounting. This second phase in the evolution, in which marketing became more sophisticated, I call Marketing 2.0. That is the phase we are in now – but is still evolving. At the same time, new technology began altering communication between the professional and the media, internally within the firm, and more significantly, between the professionals and the client. As clients became more sophisticated, they demanded more and better service, which began the process of finding ways to increase productivity. Thus began the more intensive use of technology (developing the mobile office, for example). The competitive process increased the need for more capital than could be supplied by the partners, which is why the subject of public sale of stock is now being floated. It possibly accounts, as well, for the recent rash of professional firm mergers. There is the long-standing tradition that opposes any promotional effort by professionals as undignified, and generally deleterious and demeaning to professional integrity and authority. The education and professionalism of the lawyer and the accountant is extensive and intense. There is usually undergraduate school, graduate school and professional school, followed by apprenticeship, certification, and a long climb to the partnership. Most marketers may have college degrees, and experience in the several disciplines of marketing, but no qualification or apprenticeship to match that of the lawyer or accountant. The anachronistic attempts by state and national bar and accounting societies and associations to protect the integrity of their respective professions. In too many cases, their strictures have failed to take into account the new needs of the professions to compete effectively, using modern techniques. In virtually every case in which the professionals have won rights the societies and the associations have opposed, none of the resulting changes have adversely affected the integrity of the professions. The personality and focus on imagination of the marketer tends to be very different than for the lawyer or accountant. The professional disciplines are too disparate to allow for easy accommodation. This has led to a new relationship between marketers and the professionals they serve, and the emergence of the lawyer/marketer and the accountant/marketer. It’s a new partnership in which each member of the team brings skill and experience to the table. This is producing a new sophistication to bear on the competitive environment. It is a driving force in developing new kinds of firms. The client, not the firm, is at the core of the practice. The concept of value now centers on value to the client – not the firm. Focus within the firm is on talent, rather than the traditional top-down governance structure. The legendary management consultant Peter Drucker’s concept that the purpose of a company is to create a customer is now infiltrating the professional firm. Technology is now important for more than improving productivity internally, but for improving the ability to serve the client – to the point of further changing the nature of the firm itself, and enhancing the ability to compete. Where heretofore knowledge management was a process of gathering and retrieving facts, the emphasis now shifts to turning facts into information targeted to enhancing client service, improving marketing, and keeping a firm relevant to the changing needs of its clientele. New kinds of responsibilities, such as knowledge management, business development, value management, and client retention specialists, are increasingly found in firms – often as specialties. Client service teams, once merely a collection of the firm’s professionals patched together to serve clients, are now more sophisticated and better organized to wrap clients in a blanket of genuine full service. Client development – the actual selling function – is now considered as distinct from the marketing function, which is the process of developing name recognition, defining skills, and enhancing reputation – all of which are a foundation for the selling function. These are things that are happening today. Are they universal? No. They are trends – steps in the evolutionary process that ultimately produces change in professional practice and firms, in a delicate balance that not only better serves the client and the firms, but also maintains the traditional concept of professionalism and integrity. And as the late scientist Stephan Jay Gould said, evolution is not a straight line, nor does it happen all at once or universally. 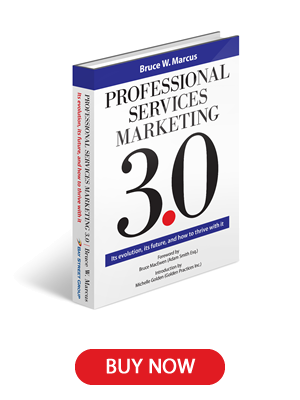 This new phase is creating the foundation of Professional Services Marketing 3.0. I contend that any professional in that cycle who doesn’t react to its dynamics will fall behind those who do.